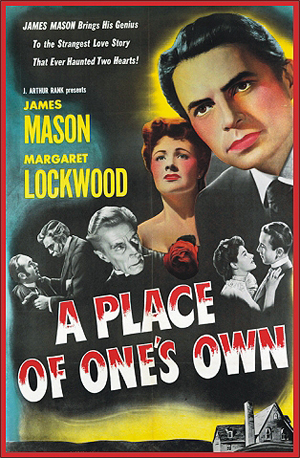 A PLACE OF ONE’S OWN (1945) James Mason, Dennis Price, Margaret Lockwood, Barbara Mullen, Ernest Thesiger. In this often chilling ghost story, Mason and his wife (and their beautiful young companion, Lockwood) move into an eerie old mansion that’s been vacant for forty years. Strange things begin to happen: voices are heard from nowhere, pianos playing in the night, etc. It’s soon obvious that the ghost of a murdered woman is afoot and taking over Lockwood’s body. Price plays the young doctor who loves her but is powerless to combat the supernatural powers slowly draining her life. One memorable moment has Lockwood playing the piano, then suddenly (ala Martha O’Driscoll in House of Dracula) breaking into a somber classical piece she’s never played before. Look for some very chilling moments. You can also spy veteran horror star Thesiger in a small but important role as a ghost. Exquisite acting, beautiful photography, and a subtle, but effective music score make this one a very effective ghost tale. 16mm.